Apostille is the authentication of a public official signature on documents to be used outside the United States of America. The country of destination determines whether the Authentication is an Apostille or LEGALIZATION (Embassy Legalization). Click here to go to the Apostille page. 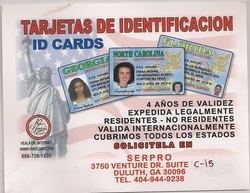 ID cards of any state from a Professional Company. This is a private ID and is not a Driver License or a Government ID. It is a Private ID and accepted by many institutions, except by the US governement. Our Mission is to perform notary services for the State of Georgia with the highest quality, respect, and accuracy as possible; to perform notary services with the highest attention to detail; to treat all clients with the highest respect and professionalism. There are thousands of different certified court documents issued by the State, County and Cities and towns around the United States. SERPRO LLC has a staff of trained personal who specializes in locating the jurisdiction and then requesting the document quickly. Professional certified translations from English to Spanish and vice-versa. Our translations are compliant with the United States regulation, 8 CFR 103.2 (b)(3) approved by the United States Inmigration Service.